Around 100 invited participants in Chiang Mai attended the 4th meeting of the World Tourism Organization (WTO) Committee on Sustainable Development of Tourism. H.E. Sontaya Khunpluem, Minister of Tourism and Sports, hosted a dinner reception at the Imperial Mae Ping Hotel in honor of the WTO Committee, with guests from Spain, Greece, Romania, Saudi Arabia, Ghana, Egypt and Canada. There were also observers from the consular services of Canada, China, Germany, Peru, South Africa and U.S.A.
At the opening session, the committee’s mission and objectives were presented by WTO Deputy Secretary, Dr. Dawid de Villiers, from Madrid, Spain, to emphasize that tourism can create a better world by contributing to the alleviation of poverty, peace, environmental protection and socio-economic development. Tourism as a powerful economic force has been constantly growing since 1950 and has only recently experienced a setback caused by the Iraq War, SARS and the worldwide uncertainty since the 9/11 incident in New York. Nevertheless, there is again an optimistic outlook for 2004 and tourism is expected to double in the next 15 years. 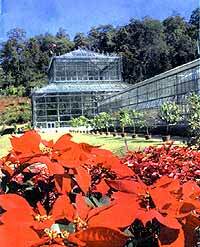 Queen Sirikit Botanical Garden in the scenic Maesa Valley north of Chiang Mai. It is not surprising that the WTO has recently become a specialized agency of the United Nations (UN) to focus on sustainability of tourism development by moving away from mass tourism into a more competitive and popular trend of eco-tourism. Asking the Minister of Tourism and Sports about the zoning of entertainment places and the controversial closing hours of bars and nightspots in Bangkok, Pattaya, Phuket and Chiang Mai, HE Sontaya made it clear that these considerations are mooted to protect the young generation in Thailand, but he also admitted that it can be counterproductive and affect tourism in the long run. Two hours drive from Maesa Valley you find the home stay village of Ban Mae Kampong. Teakwood houses await the tired travelers. Interesting to note that Thailand will have the chair of the WTO committee in the 2004-2007 triennium and the vice-chairmanship will again be taken by Greece. Dr. Sasithara Pichaichannarong, the Director-General of the office of Tourism Development in Thailand, Ministry of Tourism and Sports, gave a presentation on how to link tourism with the One Tambon One Product (OTOP) project. Ryuji Yamakawa, Chief of the tourism unit of the Economic and Social Commission for Asia and the Pacific (ESCAP) from Bangkok, mentioned various initiatives centered on human resources management and inter-regional cooperation such as the Greater Mekong Sub-Region (GMS). To raise the level of tourism awareness, clear cut policies must be announced by the respective governments in the future, not to have more tourists, but more quality tourists. Under the guidance of Eugenio Yunis, Head of the WTO Department of Sustainable Tourism, specific indicators of sustainability in tourism were discussed and developing certification systems recommended. To follow up the World Summit on Sustainable Development (WSSD) in Johannesburg, South Africa, issues such as energy, bio-diversity and small islands in relation to tourism should be properly addressed. The WTO secretariat also raised the question to review and update the many different circulating, often confusing definitions of sustainable tourism, also now often called responsible tourism. During the closing session, the representative of the WTO affiliate members and the Director-General of International Student Travel Confederation, David Jones from Amsterdam, Netherlands, stressed the need to educate tourists and travelers alike on sustainable tourism and not just put the ball in the court of the suppliers of tourism products. As a practical contribution to sustainable tourism, the active support by Germany was mentioned within the GMS country of Laos, to develop eco-tourism planning and management activities in Luang Nam Tha Province, given by the German government agency GTZ. The German volunteer agency DED has also been working with the Phou Khao Khouai National Bio-Diversity Conservation Area to promote wildlife viewing opportunities and eco-tourism services around Vientiane and along the Mekong River. Finally, there was a visit around Chiang Mai to highlight the potentials of eco-tourism in Northern Thailand and to see Sai Nam Pueng Orchid and Butterfly Farm, Queen Sirikit Botanical Garden, Pongyang Angdoi Restaurant, Ban Kampong home-stay village and Ban Tawai handicraft village as an example of a community based local showcase of sustainable tourism. An import-export seminar regarding trade with Bangladesh has been held in Chiang Mai. Following the government’s policy to push Chiang Mai as an aviation hub, Thai Airways International (THAI) has helped by creating travel packages and marketing them in Bangladesh. THAI will launch their Songkran package next month to attract Bangladesh tourists to Chiang Mai and make it one of their desired destinations. Niwat Jantarachoti, general manager of THAI in Bangladesh, said that presently, THAI is operating flights three times a week between Chittagong, in Bangladesh, and Chiang Mai. These flights have been flying to capacity and THAI plans to replace the Boeing 737-400 used on the Chittagong route with the Airbus 300-600. The new airbus plane contains a total of 260 seats and can transport up to 12 tons of cargo to correspond with the growth in number of passengers and cargo on the Chittagong route. “Very shortly, THAI will launch the Songkran package to attract Bangladesh tourists to Chiang Mai and make it one of their desired destinations,” said Niwat. “Last year a number of Dhaka and Chittagong tourists headed to Chiang Mai because of the popularity of Thai medical treatment,” he added. Bangladesh is famous for its seafood, and Vorapong Muchaotai, president of Thai Hotels Association (THA) Northern Region 1 said the hotel industry needs various kinds of imported products from Bangladesh such as seafood and other fresh foods. “If the development of the East-West corridor linking the three neighboring countries, Thailand, Burma and Bangladesh is approved and proceeds, it will support Thai-Bangladesh trade and reduce the cost of transportation, suggested Mingphan Chayawijitsilp, an organizing committee member of Thai-Bangladesh Business Council.